Upolu is the the most important of Samoa's islands. The Region of Upolu also includes all other islands of the country apart from the so-called "big" island of Savaii. Upolu was formed by a massive volcano, but there have been no recent eruptions. The island is 75 kilometres long and contains Samoa's capital, Apia, which is in the middle of the north coast and Faleolo International Airport, which is towards the western end of the island. The island is fringed by reefs and has some beautiful beaches. 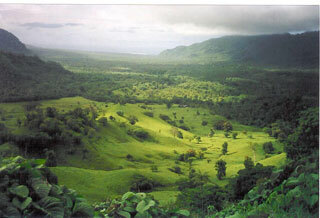 Inland is hilly, with tropical vegetation and numerous waterfalls. This article uses material from the Wikipedia article "Upolu", which is released under the Creative Commons Attribution-Share-Alike 3.0 License.